On June 17, 2004, Carla Schneider was finishing up her workday, as a delivery driver for an automotive paint supplier. During her last delivery of the day, she was making a left-hand turn into her destination when her truck was broadsided by a speeding vehicle. In early 2007, after facing the continued stress of trying to cope with her circumstances alone, Carla approached three United Way funded agencies: CNIB, the Canadian Mental Health Association, and the Central Alberta Brain Injury Society. 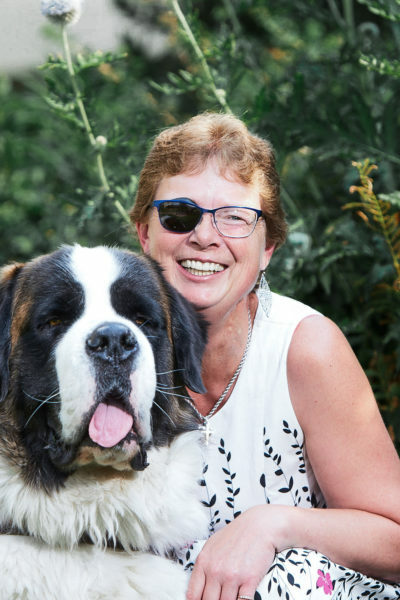 With their assistance, Carla has received ongoing support – both therapeutic and social – to help her face the reality that she is a different person than she was prior to her accident. Perhaps her most valued assistant of all – both literally and figuratively – is her service dog, Benjamin. Trained by Carla herself, Nicholas has a customized skill set that helps Carla to address her special needs on a daily basis. Carla and Benji regularly give back to the agencies that have supported them by speaking at numerous engagements throughout Alberta. Without Nicholas and the help of CNIB, CMHA and CABIS, Carla believes she would never have had the confidence to leave her own home and would have ended up housebound for the rest of her life. Carla now lives a full and enriched life and serves as an inspiring voice to others. When it comes to the support of the United Way, Carla views it as a simple matter of buoyancy: when drowning in a sea of problems, United Way’s supported agencies are there to help you float again.